In 2007 the FWBO's Padmaloka Retreat Centre began a new project to fill their main shrine room with large paintings of buddhas and bodhisattvas painted by the Buddhist artist Aloka. The main shrine room at Padmaloka is the heart of the retreat centre and is a source of inspiration to all who spend time there. And this project will make it even more inspiring!! It will become a place that progressively expresses the mythic depths of Padmaloka. 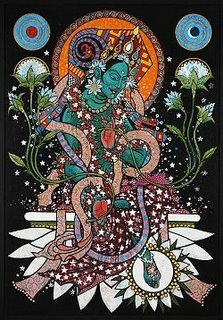 Aloka has been painting for much of his life and is concerned very much with creating images that speak to Buddhists living and practising in the modern world. So not only will this project create a wonderful environment at Padmaloka to practice in, it will also be creating a legacy for the future by providing the FWBO with inspiring images for the modern Buddhist practitioner. In autumn 2007 Aloka began the first two paintings. Recently these were completed and are now hanging in the shrine room. They are of White Tara and Green Tara, both feminine figures of compassion, and are situated to either side of the shrine room entrance. There is no definite plan for what paintings come next – these will emerge as time goes on. In order to continue this project Padmaloka is initiating a number of fundraising projects over the coming years. This year in August there is a special fundraising weekend event called “The Twenty Four Hour Garland of Mantras” . 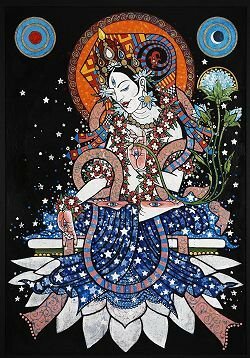 Open to all men, this will involve among other things an intensive 24 hour period of mantra chanting, for which the participants will be sponsored. This will be a fantastic opportunity to deeply immerse yourself in the mysterious world of mantra and also to help call forth the paintings yet to come! If you would like to attend this event click the link above for more details.